Saloon-soaked piano notes cavort over the cotton-candy tinkle of chimes. Air hockey pucks chink and clink. Brass bells clang. 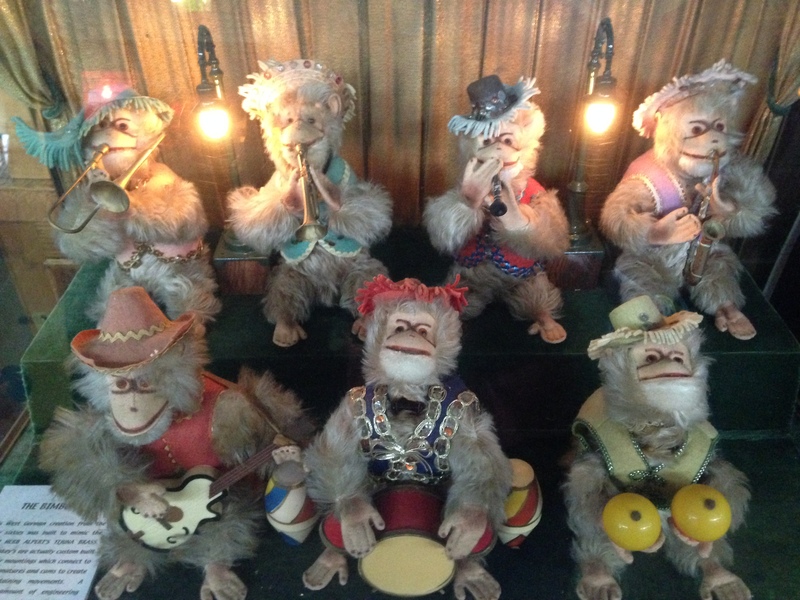 Monkeys in bright vests and pompom trimmed sombreros blow on horns. A drunken mime slouches against a lamppost, leering suggestively. Lights stutter and blink, the ferris wheel goes around and around, and a man is hanged. 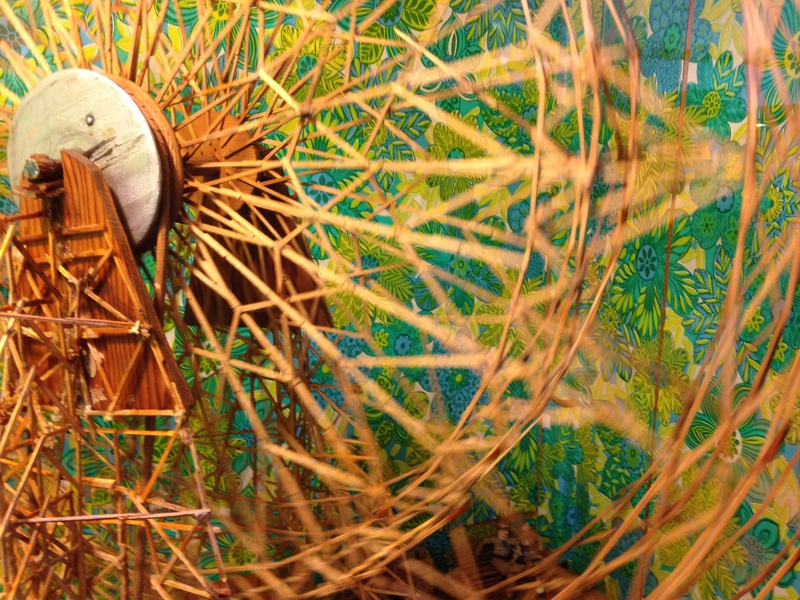 Welcome to the Musée Mécanique. Pupils dilated, head spinning in shiny-object wonder, I hastily convert my $5 into a fistful of clanking quarters and throw a coin to the monkeys for some hot Tijuana brass. Nearby, the faint plink of a quarter and whir of motors spinning to life diverts my attention from the brass-blowing monkeys. Beneath the query, a man dips his head toward a viewfinder in search of an answer. Hmmm. 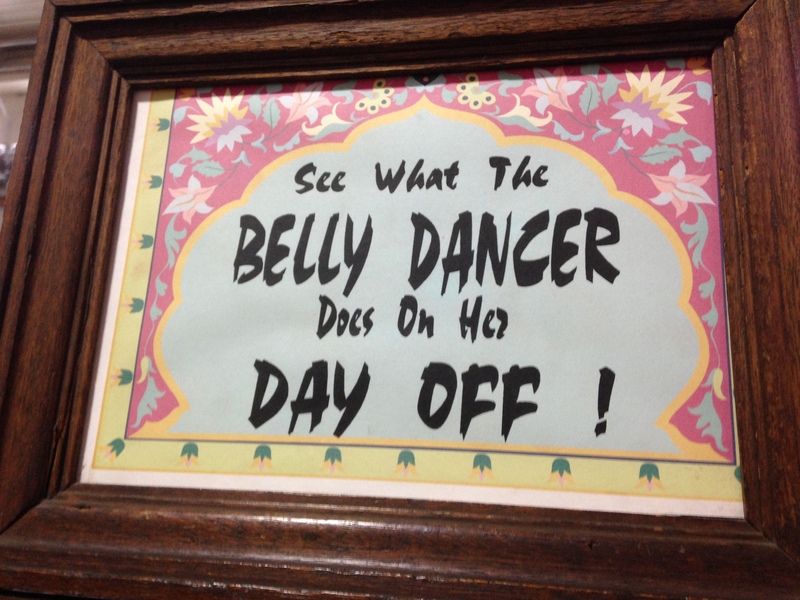 What does the belly dancer do on her day off? I wait my turn, then drop in a quarter. Tinkle-y, sepia-drenched dreamscape chimes usher in a woman wearing a white nightie and bloomers. The card drops back and the next one reveals the woman in front of a bathtub, toes poised for a dip and a towel draped artfully across her body. Ho ho! I see where this saucy little minx is taking us! Up comes the next card and… she’s… in front of a wash basin? Wrapped up in the towel? What? The card falls away and the viewfinder goes dark. Not my idea of a day-off romp, but there you have it. 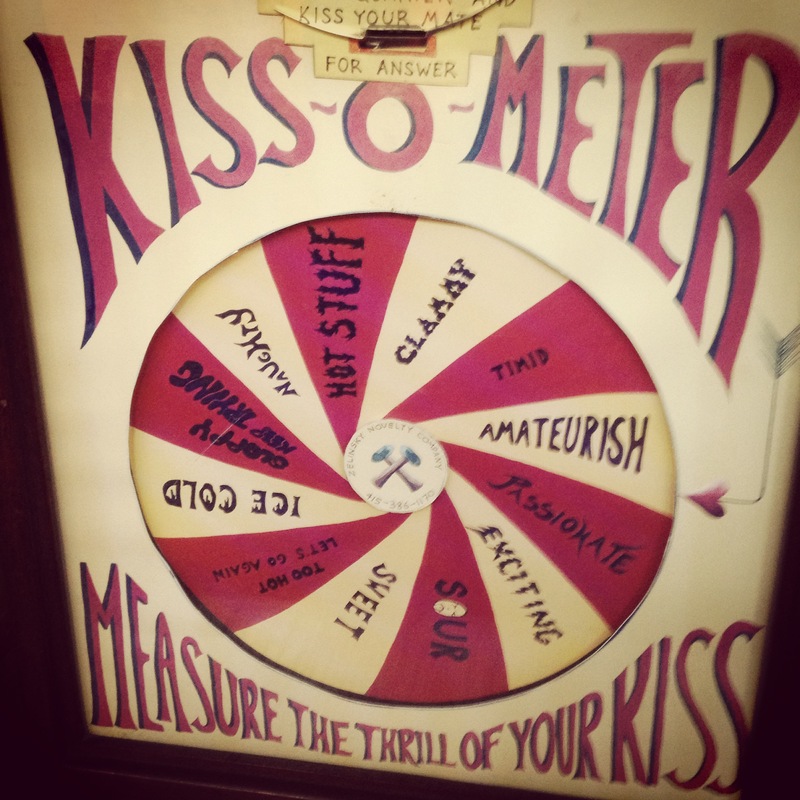 Past intricate toothpick carnival scenes and near the Kiss-O-Meter (Measure the thrill of your kiss! 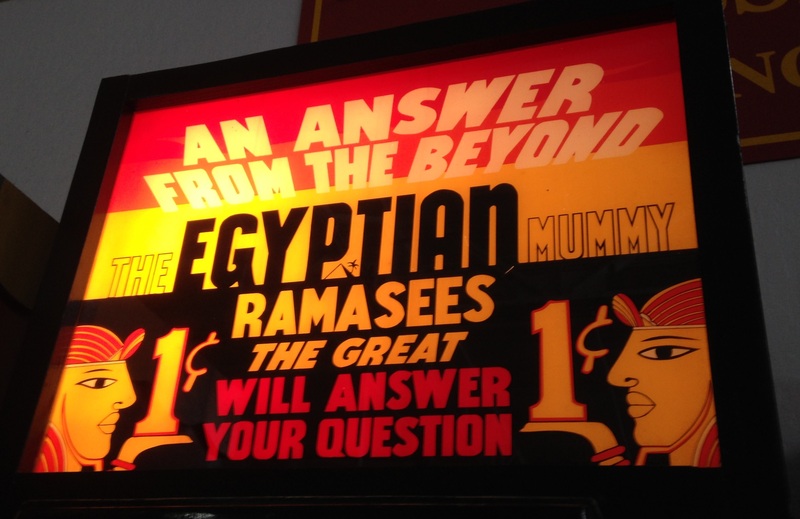 ), a light box-topped coffin promises me ANSWERS FROM THE BEYOND. Courtesy of Ramasees (?) no less! 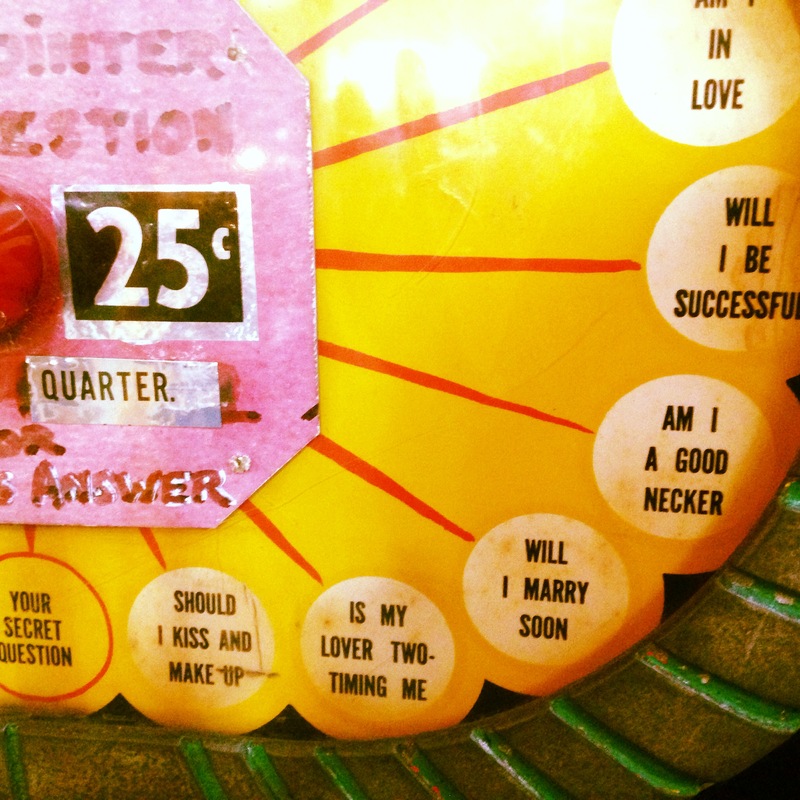 Just twirl the dial to a question, pop in your quarter, and await “Mummy’s” answer. Is my lover two-timing me? Will I marry a blonde? Am I a good necker? At last – answers to life’s important questions! Who doesn’t want to know if they’re a good necker? In goes a quarter. A shutter flicks open and a glowing, grinning red skull shakes “no.” What?! I sneak a glance around, but thankfully the couple nearby was too engrossed in Adams Family pinball to have been privy to that embarrassing revelation. Down another aisle a menacing lucha libre wrestler sneers and taunts. “Let’s try” he says, curled bicep bulging. 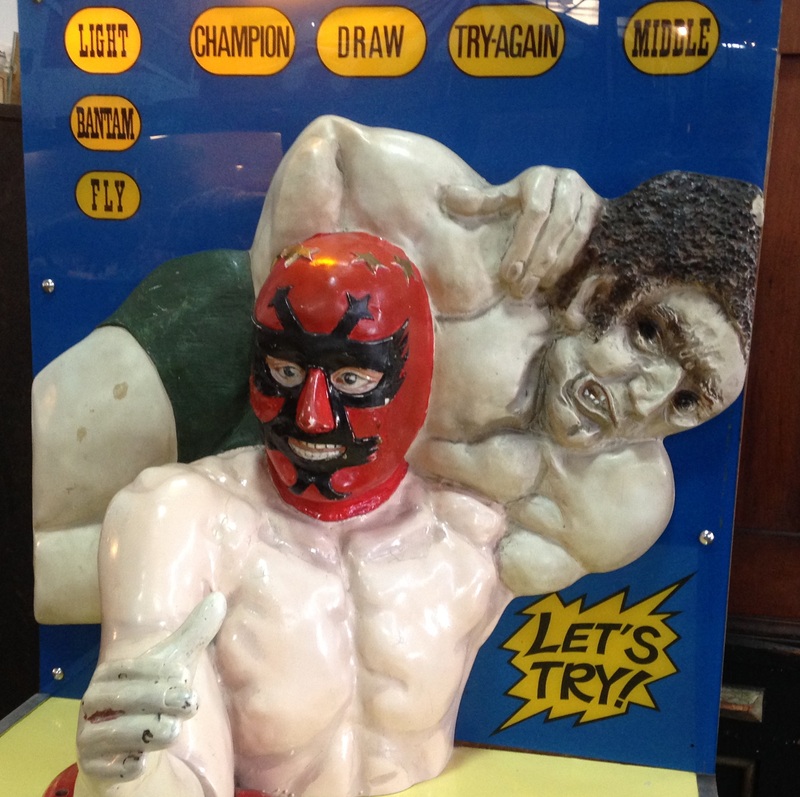 Many accept the challenge, but even at the suggested “Fly Weight” level (the scrawniest of the scrawny at two levels below “Welter”), few can match the arm wrestler’s freakish strength. Felled in a crushing defeat, I slink off to spend the last of my quarters elsewhere. En route to a throne-like seat claiming to test one’s passion factor (oh please, don’t let the heart with a woman in a dunce cap and the word “LOUSY” light up! ), I stop short at a sign—ENGLISH EXECUTION. Well isn’t this quite the entertainment throwback? I take the bait and toss in a quarter. 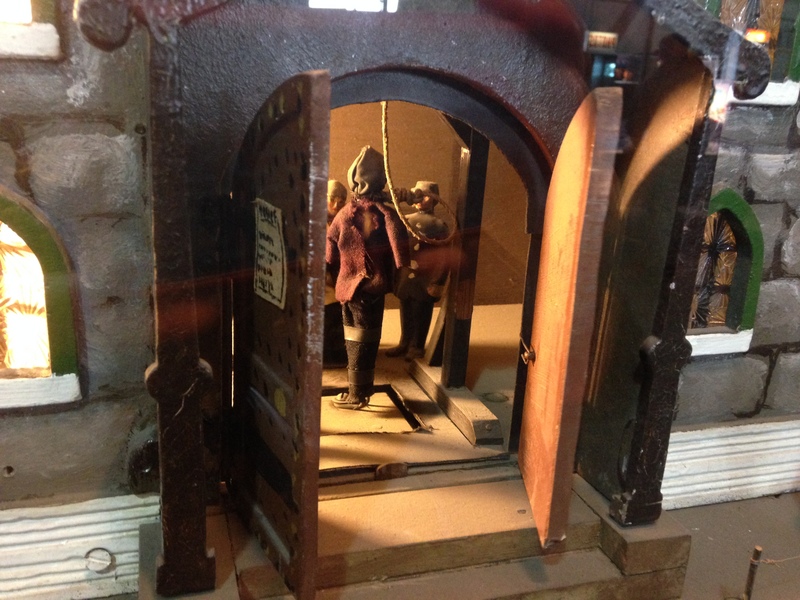 The doors of the miniature prison open up to reveal a man with a noose around his neck receiving his last rights by a priest. Really. Just as the doors begin to close, the trapdoor releases and down goes the condemned. After two more quarters and two more executions, I’m still just as dumbfounded. Plink plink! 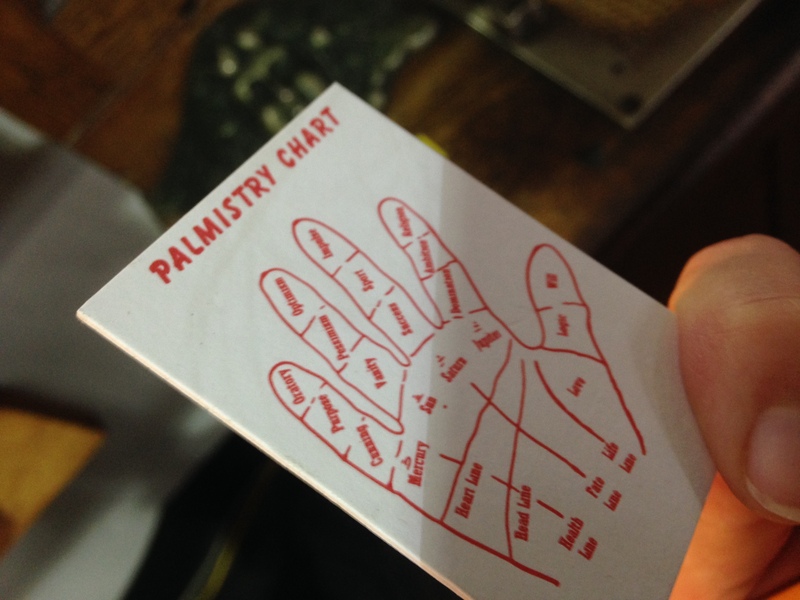 I drop my final $.50 into a palm reader. Placing my hand on a worn brass plate punched with holes, a series of metal nodes pass through, rippling up and down against my palm. A moment later, a little card pops out into a shallow dish. That’s nice and all, but I still wish I was a good necker. 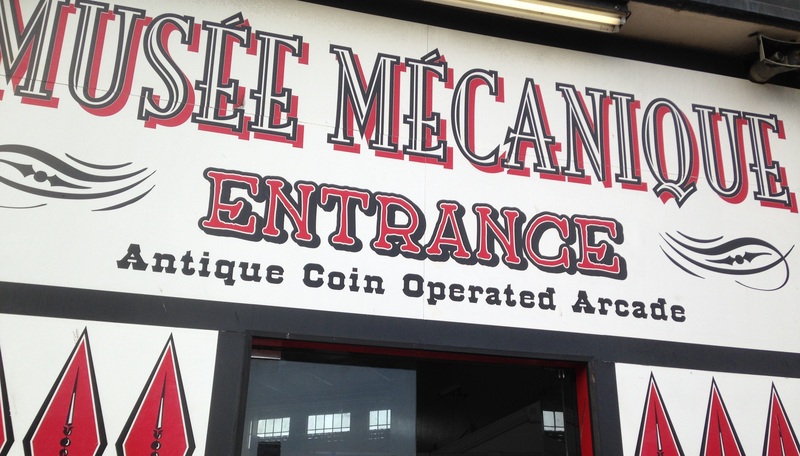 You can find the Musée Mécanique tucked away behind the crackling deep fryers and seagulls pecking at stale sourdough bowls in Fisherman’s Wharf. Entrance is free and it’s open 365 days a year. Plenty of change machines are available to keep you in quarters. Everything—from the creepily lifelike moving mannequins/dolls to the classic arcade games—is coin operated and in working condition. I’m just sad I missed the opium den. Next time though!